CASIGYs™ Blog Does My Gifted Child Have ADHD? Does My Gifted Child Have ADHD? “Does my gifted child have ADHD?” is a common question for parents of gifted children. They want to know if the problems their gifted child has with paying attention in school, and sometimes also at home, are related to their giftedness or are a sign of having ADHD. Often the only way to know for sure if you or your child has ADHD is to pay for expensive testing. If that’s not an option for you, what’s a parent to do? Let’s take a metaphoric walk around both giftedness and ADHD. My hope is that the perspective we gain will shed some light on this often confusing subject. Sixteen year old Bart plays baseball. He not only plays it, but he seems to live in order to play baseball. He’s also gifted. But he’s lost 3 baseball gloves in the last year. That’s in addition to forgetting his baseball bag, containing his shoes, bat and glove numerous times. He leaves it on the baseball field or God Knows Where for the rain and snow to ruin everything or someone to come along and decide that it’s now theirs. He’s lucky, because his teammates often look out for him. They call his attention to the fact that his baseball bag is still on the field, so he goes back and retrieves it. He’s also lucky because his parents have replaced it and its contents numerous times. It’s not that he WANTS to lose it. 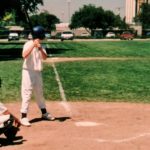 He’s just caught up in the banter with his teammates, or his thoughts and feelings about the game or the homework he’s got to do next, and doesn’t notice that he doesn’t have his baseball bag or glove with him. Until the next time he wants to use it, that is. Or until someone else lets him know he’s left it behind. Bart’s parents want to know: Does my child have ADHD? Or is all of this trouble from his Giftedness? Many studies have found that people with ADHD have decreased blood flow and decreased activity in the frontal lobes of their brains during stressful situations. [i] [ii] How can we know if Bart, from our example above, has Overexcitabilities (OE) associated with his Giftedness, or if he has decreased blood flow and decreased activity in the frontal lobes of his brain which would point to ADHD? Tests such as EEG, fMRI or Specht Brain Scans, which would show us what’s going on in Bart’s brain, are considered experimental or controversial and therefore are not typically covered by insurance plans. And psychological testing may come under Mental Health Benefits, which are often covered at a lower rate or may not be covered at all, since testing may be not covered the same way therapy is covered. So the information these tests would bring may be inaccessible to many people. So how do you tell if Bart’s behavior is ADHD or giftedness? How do you tell “Does my gifted child have ADHD?” Our first glance at the above paragraph might send us leaning toward the diagnosis of ADHD. After all, one of the diagnostic criteria for ADHD is “Often loses things necessary for tasks or activities (e.g. school materials, pencils, books, tools, wallets, keys, paperwork, eyeglasses, mobile telephones).” And another is “easily distracted by extraneous stimuli”[iii]. On the other hand, the time after a baseball game is finished is not normally a stressful situation. Let’s consider how OE might also play into this. IF the coach is chewing everyone out for playing badly or losing the game, and IF Bart has Emotional OE, he might be experiencing intense feelings of shame, remorse, guilt, embarrassment if he didn’t play well, or anger and frustration if he did play well and has to submit to the same treatment as those who didn’t. He might also be feeling helpless and any number of other emotions, “positive feelings, negative feelings, complex feelings, and identification with others’ feelings.”[iv] So if Bart has Emotional OE, he could get so caught up in his emotional OE that this is all he can focus on or pay attention to. Hence, the baseball bag or glove would be far from his mind. If Bart also has other OE, such as Sensual, Intellectual, Imaginational or Psychomotor OE, this would only complicate the situation. To help you answer the question, “Does my Gifted Child have ADHD?” let’s look at other diagnostic criteria for ADHD and also other characteristics of Giftedness. We’ll compare their similarities and differences. I began to put together my own lists, but then I found these charts which cover the territory very well, so I’ll share them with you here[v]. If you’d like to have a printable copy of this chart, click here. When considering your question, “Does my gifted child have ADHD?”, you can go through these charts and check the corresponding item which matches your situation the best. Are the check marks all on one side, or do they go back and forth? When the checkmarks are all on one side that makes it much easier to determine what’s going on. When they jump back and forth, it’s easy to get confused. And if they’re on both sides, maybe that’s when both phenomena are present. But things may not be that simple. Let’s take a look. Is there a lack of attention across the board or only in some specific situations? In ADHD, there is a lack of attention in all kinds of situations. The exception to that is TV and video games; even people with ADHD are often able to pay attention to them. If there’s problems with attention in only some situations, in what kind of situations does this happen the most? The classic Gifted scenario would be that there is a lack of attention when the adult or student is bored or uninterested in whatever is happening, or when the relevance of what’s happening is not understood or agreed upon. In my experience, this is an important place to look for a gifted student. If the gifted student is bored because she is being expected to sit and listen to material that he or she already knows, this is not ADHD. Instead, the student needs an educational setting that is appropriately challenging and stimulating. This kind of situation needs immediate attention. A 3rd grade student who can do 7th grade math needs to be doing 7th grade math (or maybe more), and does not need to be given an inaccurate diagnosis so that we can say we have “addressed the problem” when we have not done so. An adult whose attention wanders in boring meetings at work and who has trouble focusing on repetitive, irrelevant work may need to look at their work situation and how good a fit it is or is not for them. Both scenarios are fraught with difficulty. A new and different job or even line of work may not be easily found. One does not always get an accurate picture of what is entailed or expected in the hiring process. One’s field of work may have changed. It’s not unusual to find that it’s necessary to re-invent oneself. This is no small task. And it may be necessary for a student to have a diagnosis (even it if doesn’t quite fit) in order to get accommodations from the school district. Both of these items speak of “persistence”. Someone with ADHD needs to have instant rewards or quick results in order to sustain attention. The gifted person needs to believe that [whatever it is] is relevant, significant or important in the big scheme of things in order to give sustained attention to it. So we need to dig deep enough to discover what is behind the problems with persistence and lack of follow through in order to discover which kind of problems are present in this situation and with this person. Someone with ADHD may act impulsively/without thinking, but because the blood flow has been shut down or slowed down to their frontal lobes. The frontal lobes are where the Executive Function occurs. It’s where the cause-and effect reasoning happens, when it happens. If Bart leaves the baseball field without his baseball bag, what will the consequences be? Will he have do extra chores to earn the money to buy another one? Will he be grounded? What will the results of his actions (or lack of action) be? A gifted child is still a child. Even though he can think through the intellectual aspects of something quite well, he is still a child and may lack judgment, the kind that’s based on experience alone. In Bart’s situation, judgment is not necessarily applicable in remembering or forgetting his baseball bag, but it comes into play when he realizes that he has forgotten it. Then is when he has an opportunity to respond with good or bad judgement. Will he compound the problem with lying about it or trying to cover up what happened, or will he own up to it and deal with it proactively? Someone with ADHD may have trouble managing their behavior in social situations. You can understand that when the blood flow is diminished to the frontal lobes of the brain, which again is where the cause-and-effect thinking takes place, this is going to cause all kinds of trouble – the Internal Editor does not show up in time or is not able to do what is needed to appropriately control words or behavior. A gifted person may be dealing with OE- in which the speed and intensity of the internal process may outpace and overpower the Internal Editor. You can see here how they can look like one and the same process when in fact, they are very different internal processes. Both Gifted people and those with ADHD may have a higher need for physical activity. 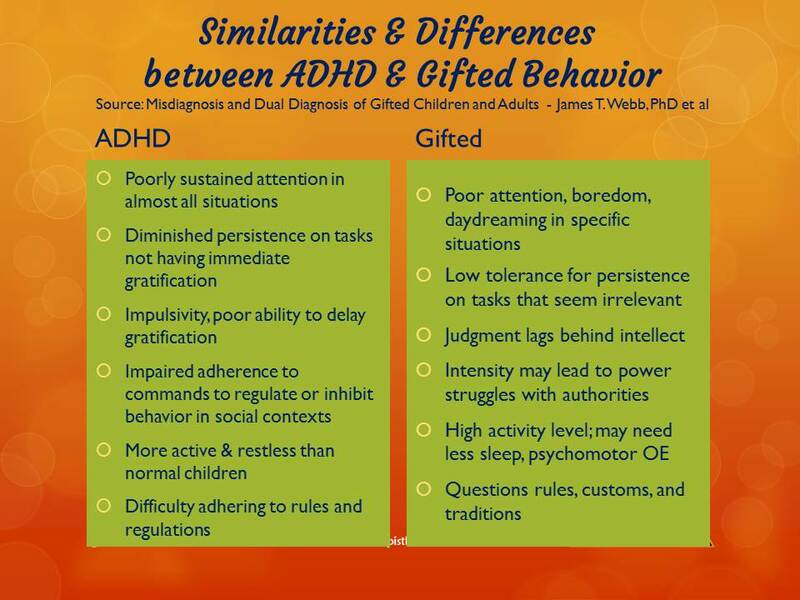 This is an area in which I have not seen significant differences between people with ADHD and Gifted people. Both groups find that when they pay attention to this need and make sure that they get frequent moderate to vigorous physical activity that it helps them in many ways, and when they ignore it, their need for physical activity interferes with their ability to sit down, sit still AND pay attention. But now I’m getting ahead of myself. When Gifted people and those with ADHD have trouble with rules, it may be, not surprisingly, for very different reasons. In people with ADHD, there may be an inability to follow rules because of attention issues – rules are details beyond their ability to attend to them. Gifted people’s trouble with rules is very different. They often need to understand both the relevance of a rule or expectation, and its purpose or function in order to remember it and follow it. For a gifted person, having a good relationship with the person giving the rules or expectations may be crucial to being able to follow them. A gifted person with Emotional OE may find it next-to-impossible to obey a teacher or boss who is perceived as mean, uncaring or unfair. Many gifted people have the ability to “see through” the surface layer of what they are told about why the rules are what they are to deeper layers of understanding of motivation. Many gifted people have trouble following rules they can’t respect or disagree with, and especially ones they believe are counter-productive. And when a gifted person has a higher ethical sensitivity or standard of behavior than others do, this often leads to not only not following the rules, but to questioning and challenging them. This can lead to gifted children being labeled oppositional or defiant when this is not what is happening at all. These children are processing things at a much deeper level and need to have someone with whom they can engage on this deep level – someone who will explore the nuances that the gifted child or adult perceives and needs to understand. A gifted person may also need to come to grips with the fact that many things, especially in large institutions such as schools, are expected not because they make sense or are useful, but for some other, more obscure and irrational reason. There seems to be an inverse relationship between the size of the organization and the irrationality of rules and expectations. This is a tall order for Gifted Adults. Gifted children and teens may be stretched beyond their current developmental capacity with such issues. Does my Gifted Child Have ADHD? This is a complex issue and these are just a few of the considerations. Understand that “You’re not Defective, You’re Different By Design!” Both people with Giftedness and those with ADHD are substantially different from the majority of people on this planet. Even though your differences are not visible, they are real. Many perceive these differences very early in life. An all-too common result of this is that both Gifted people and those with ADHD may feel like there’s something wrong with you. The truth is that both being Gifted and having ADHD contain difficulty. Once you understand and accommodate your differences; that opens the way to embracing them. Then you can migrate from feeling defective to being distinctive. You will no longer feel like it’s weird to “be weird” In the end, you can recognize these differences (that have caused so much trouble) as gifts and use them to make a creative contribution in your community. If you’d like to read more on this topic, click here. Balance the Brain and Body. First, find a way for you and your kids to start the day with 30 minutes or more of moderate to vigorous physical exercise. Yes, this may be a major shift in your whole family’s routine, and YES, it’s absolutely worth the trouble! Getting physically active like this gets the blood flowing and takes oxygen to all parts of the body, including the brain. This assists in being able to pay attention, for both groups of people. Another benefit of physical exercise is that the activity is exactly what is needed to calm hyperactivity and to meet the need for psychomotor activity with someone who has Psychomotor OE. This reduces restlessness and diminishes the urge or need to move about in situations in which it is not appropriate. BTW, exercise is also a first line treatment for both anxiety and depression. The second aspect of balancing brain and body is to reduce or if possible, eliminate food and drink containing chemicals. Soft drinks and many packaged and fast foods contain many hidden ingredients that cause trouble for both groups of people. A 2011 study sponsored by SENG found that 57% of the gifted people studied had food allergies and sensitivities, compared to only 25% of neurotypical people. I haven’t seen stats for those with ADHD. But if this kind of sensitivity is present in either group of people, food and chemical sensitivities or allergies can create all kinds of havoc with attention and much more. These are just a couple of ways to help increase attention for both gifted children and adults and for those with ADHD. In next week’s post, I’ll describe more things you can do to help yourself and your kids improve your ability to focus. For now, please share your comments below – what has your experience been with these issues? [i] Amen, Daniel G., MD: Healing ADD. 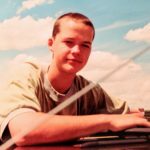 [ii] Barkley, Russell A., PhD: Taking Charge of ADHD.